Why hike to the Gaylor Lakes? If Yosemite were a high school, the Gaylor Lakes Trail would be the guy who always sat in the back of class and got voted "Who? Are you sure he's in our class?" but came back to the reunion a rock star or movie director or - most prestigious of all - the author of a useful and informative hiking website. The Gaylor Lakes trail is one of Yosemite's great overlooked hikes. Scenery Factor: High almost from the very beginning of the hike. It starts out with a steep climb, but you're soon rewarded with sweeping views back to Dana Meadows and to the mountains beyond it - Dana, Mammoth, and Gibbs, among others. The top of the pass has striking views to the mountains east of Yosemite, and to the high Gaylor Lakes valley, which has a denuded, prehistoric feel to it; when you gaze down onto it from the pass, you almost expect to see dinosaurs wandering through the grass. The valley itself contains five lakes, all picturesque, and has bonus views beyond the valley's horizon to the mountains that ring Tuolumne Meadows. There's also an abandoned 1870's mine above upper Gaylor Lake. Crowd Factor: Like many Tioga Road hikes, light on weekdays, more crowded on weekends, but still a post-Ebola wasteland compared to Yosemite Valley. Given the wide-open landscape in the Gaylor Lakes valley, it'll be easy to spot any fellow hikers, but they'll be well spread out among the many scenic spots in the basin. Difficulty: Low moderate - a 4 out of 10. There's a steep climb (with a starting elevation of 10,000 feet/3,000 meters) to reach the pass that leads into the Gaylor Lakes valley, but it's easy from then on. The valley itself is mostly flat or gently sloping. 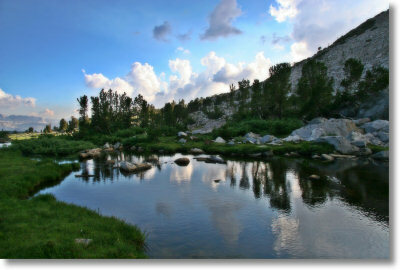 Nearest Snacks: There's a grill & convenience store at the eastern edge of the Tuolumne Meadows, 7.5 miles (12 km) west. There's also a restaurant at the Tioga Pass Resort, 2 miles (3 km) east of the trailhead. Getting There: From Yosemite Valley, take highway 120 ten miles (16.8 km) to the Crane Flat turnoff onto Tioga Road, then take Tioga Road 48 miles (77 km) east to reach the trailhead, which is just inside the eastern gate. If you're coming to the trailhead from Yosemite's east entrance at Tioga Pass, you'll find the parking lot to your right immediately after you go through the Yosemite entrance gate. Here's a Google Street View panorama of the trailhead parking area; rotate it 180 degrees to see the Tioga Pass gate. Parking: There's a lot at the trailhead that holds a dozen or so cars, and another across the road and just to the southwest in Dana Meadows.